Posted on Sat, Nov 5, 2011 : 8:55 a.m.
A playroom at the new C.S. Mott Children's and Von Voigtlander Women's Hospital. 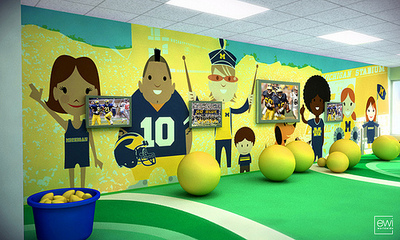 The University of Michigan's new, $754 million C.S. Mott Children’s and Von Voigtlander Women’s Hospital is hosting a public open house from 10 a.m. to 5 p.m. Sunday, Nov. 6. It will be the first, and likely last, chance the public gets to explore the 12 floor, 1.1 million-square-foot facility. The hospital is replacing the current Mott building, which was built in 1969 and is now considered antiquated. The new hospital is the most expensive endeavor in U-M history and one of the costliest projects in the state. The open house will include several family-friendly events, including a scavenger hunt for children and visits with therapy dogs. AnnArbor.com has covered the hospital extensively, so before you stop by Sunday's event, read some of our comprehensive coverage. Sun, Nov 6, 2011 : 5:43 p.m.
Sun, Nov 6, 2011 : 3:20 p.m. Thinking of going to check it out...but it's a bittersweet idea for me...so happy for today's children, and still feel sad for yesteryear's....when I was a child, the even the very BEST children's hospitals in the country had only a closet of old toys and the inevitable copy of Curious George Goes To the Hospital as a &quot;playroom&quot;...and metal cages, yes,-- like dog or monkey cages, for children. Padded hand and foot cuff restraints...I feel so envious and yet so estatic for today's children. Sun, Nov 6, 2011 : 11:37 a.m. Sat, Nov 5, 2011 : 9:02 p.m. Sat, Nov 5, 2011 : 6:02 p.m.
We went to the Creator's Preview event this morning and the new hospital is breathtaking. The kids deserve this beautiful space! I encourage everyone who has some free time to go tomorrow and tour this wonderful hospital. We will forever be grateful to all who work at Mott- especially the Michigan Congenital Heart Center team and the staff on 5 East. We know what it's like to have Mott be our second home and this will really lift the spirits of the families who spend a lot of time there. A lot of thought and hard work went into this hospital.